These fascinating PS5 console, controller, and virtual actuality designs & sketches were created by skilled artist Danny Haymond Jr. Danny developed these over several months putting a lot of time and effort into this. See all his best PS5 designs below. If you want the future plastered all over your desktop (and who doesn’t?) this wallpaper will do the trick. We’ve got everything from controller to console concepts. As you can see, our current concepts from Danny Haymond Jr.showcase a more sleek and slim version of the console for the future generation. Various rumors are stating Grand Theft Auto 6 will be on the PS5. Imagine what that would look like on this epic console. It would look fairly insane, that we can be sure of. We’ve discussed the concept of virtual reality a lot on this website, but the next step beyond VR is bringing it into the real world. For some, that may be augmented reality, but we like to dream bigger here. Both the console and the controller in this concept have the capacity to project holographic images, which could be manipulated via motion gestures. How’s that for motion gaming? Let’s take a closer look at the console itself. The key feature we’re looking at here is the aforementioned holographic capability. This allows the system to notify you of friend requests, invites, and anything else via holographic images that project from the system and controller. We’re also predicting cloud technology as a major component, which will result in faster processing and less hardware required for the console itself. I’m the kind of person who doesn’t like to stop my game when a message come in. This design would allow the PS5’s holographic display to show the messages in full while you keep up your gaming. These days when you look at the back of a console or a PC if you’re brave, there are a lot of slots and plugs. With the PS5’s cloud-based technology, only the basic needs will be present here. You’ve got power, HDMI for video, and a few extra plugs for auxillary or accessories like a visor or headset. Games will play similarly to how they do today. Holographic displays on the console and controller give another dimension of gaming. They can display maps, upgrades, etc. The buttons and analog pads are room temperature quantum locked super conductors that respond to the slightest movement. Controller accuracy is a huge focus for both casual gamers, and for e-sports players. We’ve managed to get our controllers pretty accurate, but there’s plenty more precision to be had. The PS5’s controllers will feature quantum locked super conductors. These can detect even the most minute of movements. Your analog sticks will be far more accurate with this technology in place. Virtual reality only stimulates one of the senses, but this concept will allow for a more enhanced experience that stimulates all five senses. This can be done with a neural uplink, which may sound painful, but we’ll be able to establish this kind of link without the need for anything you’ve seen in science fiction. Some of you may remember we showed this initial concept back in February 2014. This was before Sony introduced “PlayStation VR” the following month in March. The campaign was funded successfully and is currently in the testing stage. This goes to show that gamers are hungry for new ways to experience their favorite games. The controller just won’t do it anymore, so we’re looking for new and exciting ways to play games. This is one of them. What about a PS5 application? All Playstation 5 concepts created by Danny Haymond Jr, a talented artist. View his portfolio here: coroflot.com/haymonddl. Be sure to e-mail him and thank him for his designs and vision to the future! 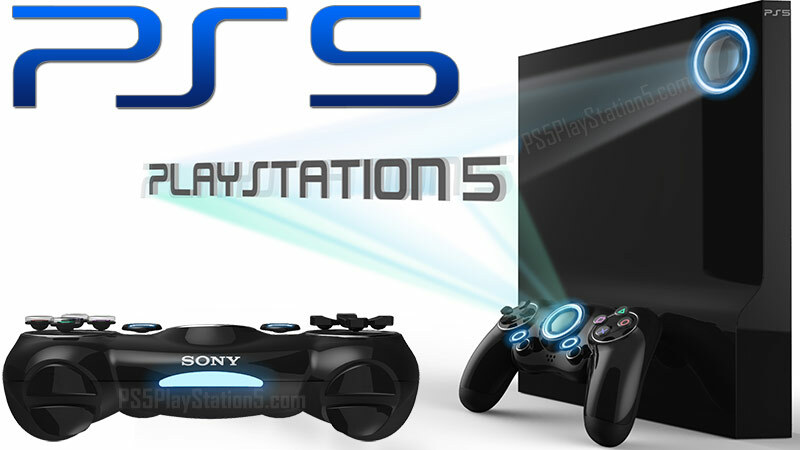 What features would you like to see in the PS5? If you want Danny Haymond Jr to create more concepts, post your comments below! I think they should do the new controller and designs because it looks like it could take technology to the next level in electronics. A big a fan of PS1, PS2, PS3 and PS4 games. When is the brand new PS5 (Playstation 5) console coming out? I am feeling so excited right now. But I still currently have my PS4 system and I love it so much. I think it looks perfect.. The level of detail that went into this concept is pretty fking amazing. Love it! Kudos to the artist for the amount of time he must have put into it. I’m throwing away my PS4 I want this like yesterday.